Cherries rule in summer, and it’s hard to find any that are sweeter or present more beautifully than those growing on Stella cherry trees. The tree offers several gorgeous displays, the first in spring when the frothy blossoms open, the second when the heart-shaped Stella sweet cherry fruit appears, ruby and ripe. 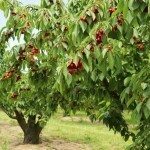 If you’d like more Stella cherry information about this great fruit tree, read on. We’ll also provide tips on how to grow Stella cherries. If you like cherries, you’ll love Stella sweet cherry fruit. The cherries are exceptionally firm and sweet. They taste wonderful infused with summer sun from your backyard. They are also large and bright red, just like cherries in your dreams. And Stella cherry trees also offer some extra advantages over other popular fruit trees. First, the tree’s showy white blossoms are among the first to appear in spring. They really dress up your backyard and last a long time. And it’s entirely possible to start growing Stella cherries in a backyard, even a small one. The standard trees only grow to 20 feet (6 m.) tall, with a 12- to 15-foot (3.5 to 5 m.) spread. Those interested in learning how to grow Stella cherries should start with the hardiness zone. Like many other fruit trees, Stella grows best in U.S. Department of Agriculture plant hardiness zones 5 through 8. Growing Stella cherries is particularly easy since they are self-fruitful. That means that, unlike so many varieties, they do not need a second compatible tree to successfully pollinate the fruit. On the other hand, if you have another tree that isn’t fruitful, Stella cherry trees can pollinate them. Assuming you’re living in an appropriate hardiness zone, you’ll do best growing the cherries in a sunny location. Full sun is the preferred site and makes for the most fruit. What about soil? These trees need well-draining, loamy soil with a pH between 6 and 7. What else do you need to set up your orchard to start cranking out a harvest of Stella sweet cherry fruit every summer? Patience. The trees can take 4 to 7 years to fruit. Read more articles about Cherry Trees.